Kuoda Travel is highly recommended!! My daughter and I recently traveled to Peru to see the Incan ruin of Machu Picchu. Kouda represented Peru and the Incan culture at its best. Founder and president, Mery Calderon, visited us on our last day in Cusco to hear about our personal experiences. We couldn’t have asked for a more detail-oriented itinerary, designed by Urpi Herrera and my daughter. The properties we stayed in, as well as the restaurants throughout our trip, were in stunning settings with excellent amenities. All week we had a private van and a Kuoda representative at our side at every hotel, tour, and airport check-in. At the last minute, the staff worked efficiently behind the scenes to resolve a canceled flight for our connection back to the U.S. They made it an amazing and carefree trip! This trip could not have been more perfect! Kuoda Travel is highly recommended! Our next trip with them will be to Bolivia!! Thanks to everyone at Kuoda. Percy Ayala was our excellent and experienced (Inca Trail) guide for three days through the Sacred Valley of the Urubamba River. We were entertained by Peruvian and Bolivian music as Mr. Arnold drove us between each place. Our visit included Maras, Moray, and a hike between the Pumamarca ruins to Ollantaytambo area on a pre-Columbian trail on the mountainside. During our stay we experienced many amazing Peruvian meals and unique hotel locations. One memorable meal was an organic meal cooked by a top chef in her private mountainside home. We also experienced an unforgettable ancient Incan pachamanca feast. That meal was made with marinated meat and vegetables cooked underground by hot stones. Our dinner reservations throughout the trip were always delicious and in beautiful locations. Each property we stayed in was unique and wonderful. In Chinchero, we enjoyed a visit to a weaving coop. When we arrived, we were given the iconic Peruvian-style hat, cape, and skirt to wear. They shared the weaving and construction process for the beautiful things they make at the coop. They described everyday life to us as we sampled cheese, vegetables, bread and tea. We enjoyed hearing them speak to each other using the ancient Quechua language. Victor was our knowledgeable guide at the Machu Picchu site near Aguas Calientes. Our most amazing trip experience was on the following morning. We climbed the 2,100 step “Stairway of Death” to the top of Huayna Picchu to view Machu Picchu from the opposite mountain. In Cusco, the historic Center of the Incan World, there were so many incredible museums, cathedrals, squares, and marketplaces to visit. We also attended a pisco tasting and cooking class given at a restaurant by Jose at the Mercelo Batata Culinary Experience. It was a fun and amazing mix of history, culture, food and drink preparation! We thoroughly enjoyed the beauty, culture, history, and generosity of the people of Peru. Thank you, Kuoda, for our most memorable trip! Kuoda is the travel company that delivers exactly as they promise and even more. Mery Calderon, the founder and the president of the company based in Cusco, Peru has assembled a team of passionate guides, greeters and drivers who customize your trip to your needs and more important provides VALUE for the money you spent to enjoy this great country. The punctual staff meets and greets you in clean and spacious vans and make the process of arrival at airports or train stations and checking into hotels with ease. Over the course of nine days we spent one day in Lima at the Villa Barranco boutique hotel well located in the historically area of Lima within walking distance of the promenade on the water front and a safe walking distance to restaurants. Bianca and Caeser were are fabulous knowledgeable and kind guide and hosts. We flew to Puerto Maldonado and we were wisked downriver to the Inkaterra Reserva Amazonica and fabulous stay of food and hiking in glamour camping conditions. Yet another flight to Cusco where we were greeted by Jose our driver, Jason our liaison and then there is Santiago , our guide for four days. It is all about having a great guide when you travel and that we did with intelligent dialogue , explanations and personal stories that make this trip memorable. The Inca trail by car with numerous hiking up the mountains and then a list to Machu Picchu over two days. 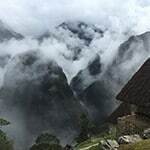 Follow their advice and stay the night so you can enjoy a magical sunrise and hike to sungate and for a great challenge also to the WaynaPicchu hike before returning by train to Cusco . Great local company to use for your travel plans Short and Sweet is tough to beat. There are those who have jobs, those who have careers and those who are passionate about their life’s calling. Kuoda’s staff are the epitome of passion. Intelligent, witty, generous, warm and inviting are only a short list of the qualities possessed by this company. I have been to 20 different countries and my trip to Peru was simply the most memorable and fulfilling trip of my life…all due in part to Kuoda’s attention to detail and desire to serve. I am counting the days until I can return to Peru. Outstanding job Kuoda Team! One of the best personalized Travel Companies. Have traveled all over the World, however, Kuoda exceeded all expectations. The diligence and attention to detail ensured our visit to Peru was the best ever. Ask for Jeremy to be your travel guide in Cusco and Machu Picchu, Urpi to be your overall planner and the Owner Mery Calderon is available to provide any assistance anyone may need. Urpi suggested the best hotels for any budget and her choices were hand picked for our needs. Really appreciated Jeremy’s understanding of our desires – which he accommodated with a sense of humor.